Derrick of Ledbury sent me some photos of moths that he trapped last week in Ledbury. 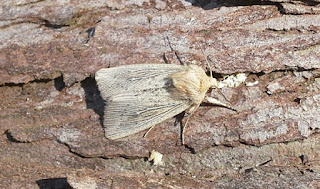 Amongst the Flames, Peppereds, Heart and Darts etc was an Obscure Wainscot which I believe is possibly a first record for VC36. I know they are doing quite well in Worcestershire but Herefordshire lacks some of the nice wetland sites of VC37. Well done Derrick!